A BROKEN TOILET IS A BIG PROBLEM. WE CAN FIX IT QUICKLY. 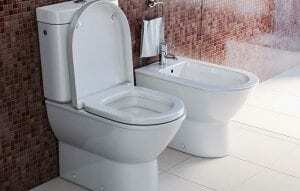 Conyers Plumbing offers complete toilet repair and installation services. We’ve all felt that sinking feeling when we flush the toilet, and it won’t stop running; the shock of opening the water bill, and it’s four times the normal amount; or worst of all, the panic that sets in when the waste-filled water begins to rise after being flushed! Conyers Plumbing understands! Our team has seen it all, and we get it! There is almost nothing worse than a broken or clogged toilet. Whether you have a clogged toilet or need a simple toilet rebuild, we can work on it! Conyers Plumbing will diagnose your toilet problem and let you know exactly what needs to be done and how much it will cost before we begin the work. We will never attempt to sell you parts or services that are not completely necessary! Unfortunately, toilet repair does not always work, or perhaps, you just want a new toilet. Whatever the reason, you can count on Conyers Plumbing to install your new toilet as quickly, affordably and easily as possible. Call Conyers Plumbing day or night to handle your toilet repair and installation needs!